Remember the haze in 2013 that hit the worst level in 16 years and the dreadful day when Pollution Standard Index (PSI) exceeded the critical level of 400? With our island shrouded in haze, people scrambling to get N95 masks and parents being fearful to bring children or elderly out, no, that wasn't a pleasant experience in the least. Even though the situation this year looks more promising, we should never take clean air for granted. As a family who loves to go outdoors, when the air gets bad outside, it becomes a natural tendency for us to assume that we will be safer in our homes. Yet, does staying indoors equate to protection from dust and dirt? A study in the US shows that indoor air pollutants have been ranked among the top five environmental risks to public health and may be 2 to 5 times – and occasionally more than 100 times – higher than outdoor pollutant levels. Even if we shut all windows and doors, harmful particles such as pollutants, allergens, pollen, and mould still find a way to creep into our homes. If you have a baby at home, who by the way breathes up to four times faster than adults and is potentially more vulnerable to fine particles, indoor air pollution is even a greater cause for worry. We were recently introduced to the Dyson Pure Cool that helps to capture up to 99.95% of ultrafine particles as small as PM0.1 – which includes harmful components found in the air during the haze periods. I've always been fascinated by Dyson's Air Multiplier technology and the unique blade-free design of their fans. 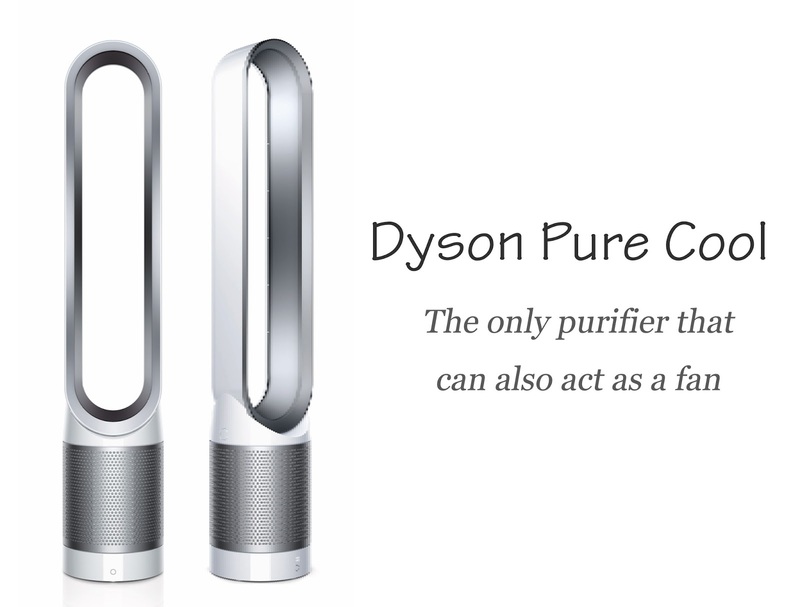 Now, the team at Dyson has stepped it up a notch by introducing a new product - Dyson Pure Cool which is the only purifier that can also act as a fan. How cool is that? 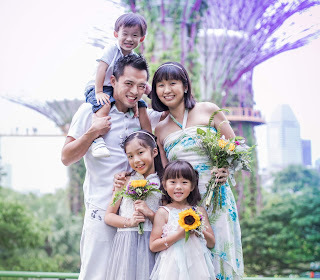 Now, we live in a cosy HDB flat with six people under one roof and let's just say that there isn't a lot of space to move around given the bulk of belongings. There are stacks of boxes, hidden corners and countless hard to reach places which can be extremely challenging to clean. In addition, with two lively kids who love to run and hop around the house or hide in every place they can find, the invisible dangerous particles are constantly being disturbed and re-suspended into the air. Particles that are small enough to travel deep into the respiratory tract are considered dangerous pollutants and can result in both short and long term health implications – especially in children and the elderly. Using powerful Air Multiplier™ technology and an energy-efficient DC motor, the Dyson Pure Cool purifier fan draws in air via a mixed flow impeller. The air is passed through a patented 360° Glass HEPA (High-efficiency particulate arrestance) filter, containing 1.1m² of constructed microfibers. Unlike other purifiers that rely on non-woven filters, the Dyson Pure Cool’s filter has been pleated 254 times, meaning it can trap even the smallest particles – including pollutants, pollen, bacteria, viruses and particles down to PM0.1. Clean air then leaves the amplifier loop at a high velocity and is directed over an airfoil-shaped ramp. Now, considering that the machine purifies and circulates all year round, we might assume that the filter needs to be changed regularly and maintenance can be a problem. However, the Dyson Pure Cool filter has been engineered to last for approximately 4382 hours and based on 12 hours of use everyday, the filter will need to be replaced approximately just once a year. Unlike some purifiers that come with a laborious filter changing process, the Dyson filter can be changed in a simple 4-step process in less than 60 seconds. Not only is the Dyson Pure Cool stylish in design, it also comes with a neat remote control - used to switch on and off, oscillate, adjust air flow and set sleep timer - that cleverly rests on the fan's magnetic top. In fact, the remote control is so thin and light that I almost couldn't locate it when I took the product out of its original packaging. Here's a look at how the Dyson Pure Cool fits into our humble home. 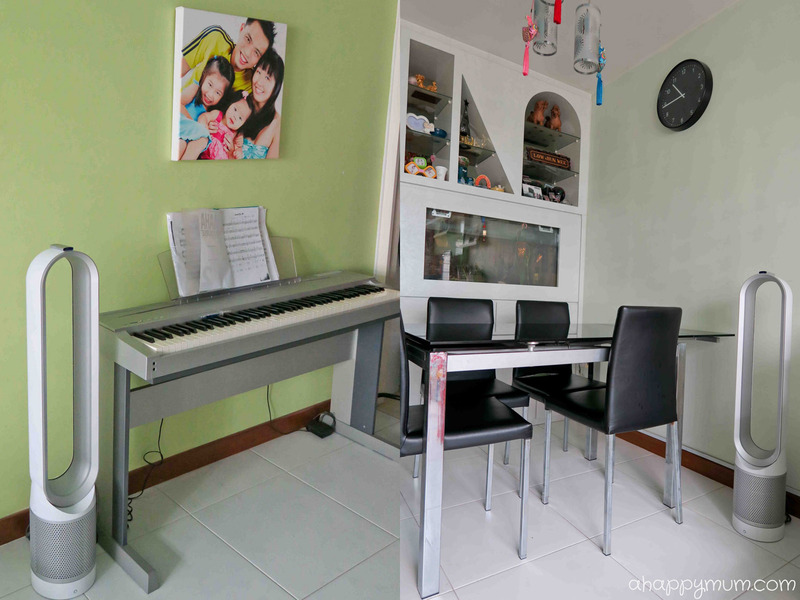 With its compact footprint that makes it up to 70% smaller than conventional purifiers, I was pretty amazed that it could fit into every room and corner nicely. 1) Can be knocked over by a child. While its light weight of 3.58kg ensures portability and ease of carrying, that also means even my toddler has the means to make it topple. 2) Airflow is not as strong as we imagined. It might be that we are used to fans with strong winds, so we tend to turn our Pure Cool up to the highest level of airflow which means that the noise is at its greatest too. We have to remember that this is not intended to be a high velocity floor fan but a 2-in-1 air purifier and multiplier. 3) Cannot tip up or down. While the fan can oscillate sideways, it cannot be tilted to point up or downwards. This can be tricky when it comes to my big girl who sleeps in the upper bunk bed or my toddler who sleeps on a mattress on the floor. All in all, I have to say that we are definitely loving our Dyson Pure Cool and nearly everyone who comes over for a visit comments on how sleek and trendy it looks. For someone practical like me who is not so much into diamonds or flowers, though I like the unique aesthetics, I appreciate more of the functionality and the fact that it is helping my family, especially my kids, to breathe better and safer at home. The Dyson Pure Cool is available in two colours - iron/blue or white/silver and retails at S$999 in all major electrical and departmental stores. For more information, go here. 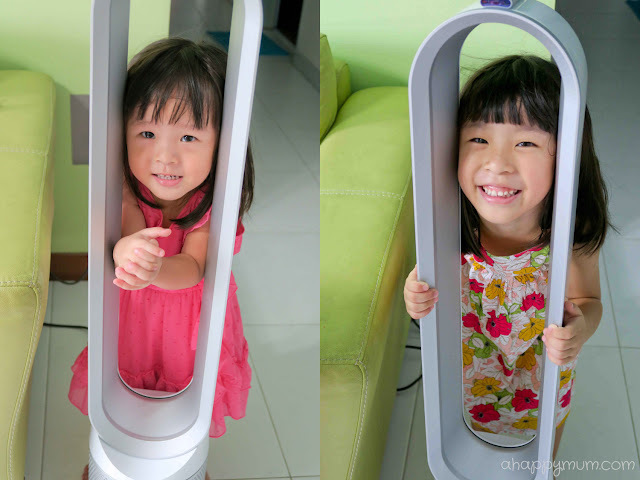 Disclosure: We received a Dyson Pure Cool set for the purpose of writing this review. All opinions are my own. 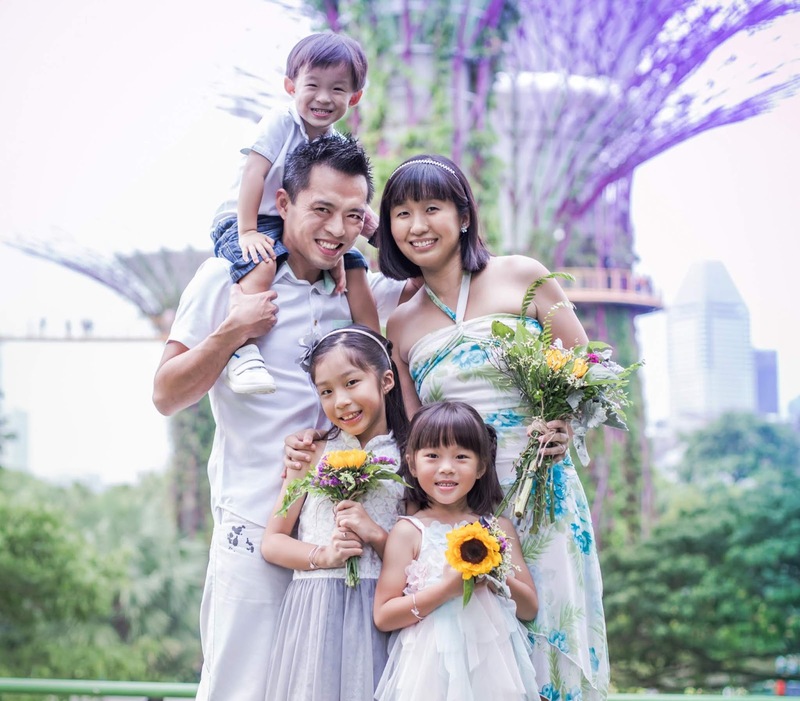 Thanks to all of you, A Happy Mum is a finalist in the Best Family Blog category in this year's Singapore Blog Awards! If you would like to show your support for your favourite bloggers, you can do so HERE (you need to do a one-time registration and can vote for your 10 favourite finalists once a day). Yippee! 10 more days before voting closes!